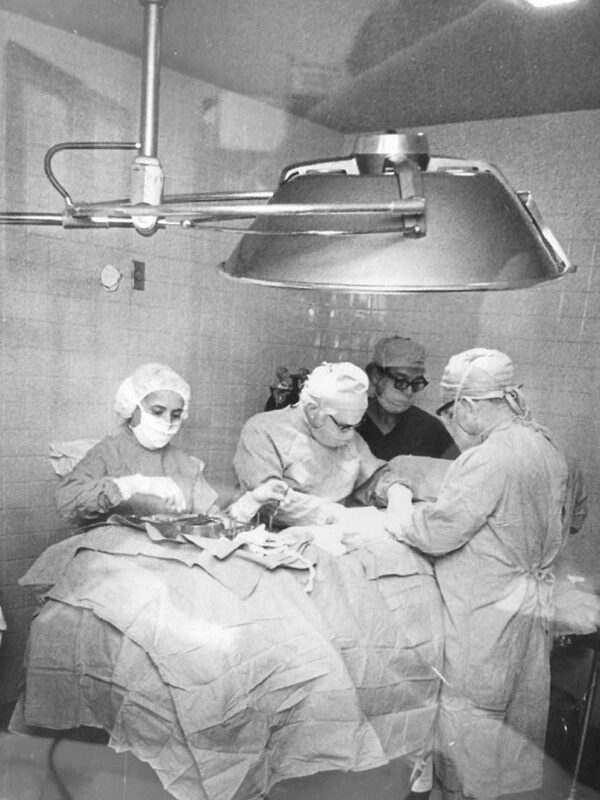 Dr. Mario Ramirez, far right, performs surgery with Dr. Leonides Cigarroa in a small hospital in Roma that Ramirez opened in 1958, the first in the city. There was a revelatory moment in Starr County on Monday when The Monitor was asking residents their reaction to news of the death of Dr. Mario E. Ramirez that morning. “He delivered me,” came an almost universal response in reaction to this family practitioner who helped bring countless babies into this world. Whether that response was a literal or a metaphorical allusion, it seems apt for a man who devoted his life to the delivery of health care to the people of South Texas and to his devotion to education, as a regent for the University of Texas System, which would allow for the training of even more medical professionals in this region. That’s why the death at age 91 of Dr. Ramirez is so significant to the generations of South Texans who have benefitted and will continue to benefit from the vision of this man. Indeed, former University of Texas Chancellor Francisco Cigarroa credits Ramirez as one the leaders who had the original vision that led to last year’s landmark opening of a medical school in the Rio Grande Valley. “He is basically one of the founders of public health care in South Texas,” Cigarroa told Monitor reporter Danya Perez-Hernandez. During an earlier era of Texas, as one of the sole practitioners of medicine in impoverished Starr County, Ramirez not only delivered generations of new residents to this region, he also recognized the need for a formalized healthcare system. And he delivered on that as well. Whether it be through the creation of a family clinic in Roma in 1950 or the founding of a community hospital in that same town eight years later. Or whether it be through the recognition that the political process was essential to the goal of healthcare delivery and his ascension to Starr County judge to act on that realization. Whether it be through his leadership as county judge that led to the construction and opening of the Starr County Memorial Hospital in 1975 to succeed the Roma facilities. Or whether it be through his service on the University of Texas Board of Regents in which he commandeered the intersection of education and health care, this man of vision addressed an essential component of South Texas development: medical services. His passion for the people of South Texas and his purpose on behalf of these people won Ramirez many accolades — all the way to the White House where he was honored by then-President Jimmy Carter after being named Family Doctor of the Year in 1978 by the American Academy of Family Physicians. But it was his commitment to South Texas and his drive to provide medical care that the foundation of his vast legacy resides. Among the honors he received — the UT Distinguished Alumni Award; AMA’s Dr. Benjamin Rush Award; an endowed professorship at the UT Health Science Center in San Antonio; an elementary school named in his honor — perhaps none is greater than the creation of the University of Texas Rio Grande Valley School of Medicine, which begins its second cohort in the fall. This fledgling facility, on which the hopes of so many in this region are placed, now pays a silent tribute to Dr. Mario E. Ramirez and his vision for the Valley. And we can only surmise that he was pleased with its creation. For that reason, we think it appropriate and we call on the leadership of the UT System and of UTRGV to consider naming some component of the medical school in his honor.